President Donald Trump on Friday doubled-down on his praise for Montana Rep. Greg Gianforte’s 2017 body slamming of a newspaper reporter, despite global condemnation of his remarks in Missoula Thursday night. “Gianforte” was trending as a hashtag on Twitter, with more than 116,000 tweets about the incident – most of them expressing outrage for the president’s support of violence against journalists. “Do you regret bringing up, last night at your rally, the assault on a reporter by a congressman?” came the question. 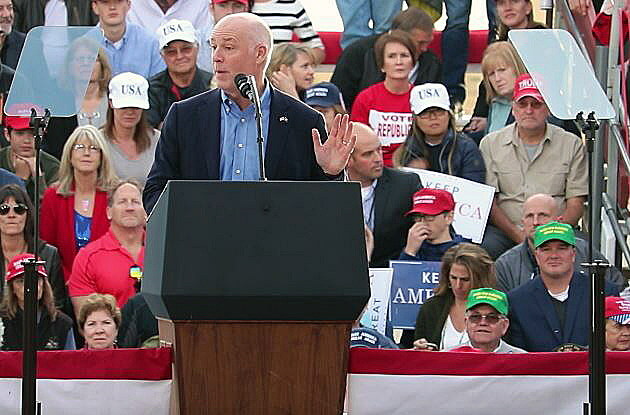 At Thursday’s rally, Trump thanked Gianforte for a rousing introduction. The president gestured to simulate a body slam like that which landed Ben Jacobs, a reporter for The Guardian newspaper, in a Bozeman emergency room after a confrontation with Gianforte on election eve in May 2017. The crowd erupted in laughter and cheers. The expressions of shock, then anger, began within minutes on social media – with many drawing the connection between Trump’s endorsement of the attack on Jacobs and his lack of retribution for the death of Washington Post columnist Jamal Khashoggi at the hands of the Saudi government. “President Trump’s explicit praise for Rep. Greg Gianforte’s criminal assault on a reporter marks a startling new low in terms of the White House’s open hostility toward the press. House Majority Leader Rep. Steve Scalise attempted to blame the media for the outcry, tweeting that the president was joking. The president himself rendered that explanation nonsensical, repeating his praise at the Scottsdale news conference and seemingly distancing the attack on Jacobs from Khashoggi’s murder. Following the May 2017 incident, Gianforte and his staff initially denied the attack but the congressman ultimately pled guilty to misdemeanor assault. Jacobs asked Gianforte a question about the Republicans’ health care plan in the seconds before he was slammed to the floor. On CNN Friday night, the target of the congressman’s attack spoke out for the first time since the president’s remarks in Missoula, referencing Trump’s praise of Gianforte as a “tough cookie” and defending himself against suggestions that he was the provocateur. “A tough cookie doesn’t attack somebody out of nowhere, without provocation, for asking a question about health care policy,” Jacobs told CNN’s Anderson Cooper. So far, Gianforte has not commented on the president’s remarks. His opponent in the Nov. 6 election, Democrat Kathleen Williams, had just released an advertisement earlier Thursday reminding voters of the 2017 attack. “We can do better than a congressman who assaulted a reporter and lied to law enforcement to save his political skin,” she said.